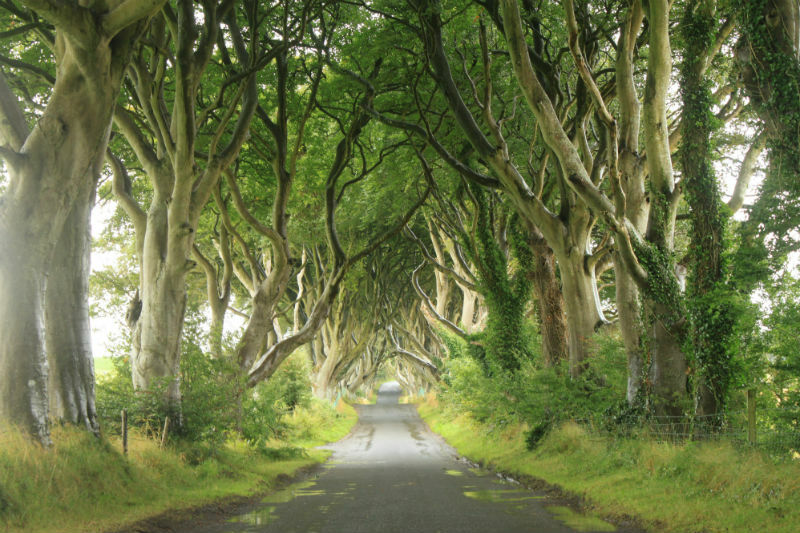 The Dark Hedges refers to an avenue of Beech trees in County Antrim. The trees are now over 200 years old and have become one of the most photographed places in all of Northern Ireland. The trees were planted by the James Stuart, a preacher’s son who was born nearby in 1743. John placed the trees along the drive to his new mansion as an impressive landscape feature. He named the mansion Gracehill House after his beloved wife Grace, a County Tyrone girl who was the daughter of a doctor in Stewartstown. James lived to be 81 years old and had nine children at Gracehill. Of his nine children – his second eldest, William was in the Royal Artillery and died in battle in Barbados. Margaret whose alias was “Cross Peggy” never married and lived until age 89. Elizabeth and Grace were the last two to be born, and they both died young. Gracehill is now a golf course with the manor house as a feature, and the drive is now a public road making the Dark Hedges accessible to photographers and visitors who want to see these amazing trees with their tangled, silvery branches. 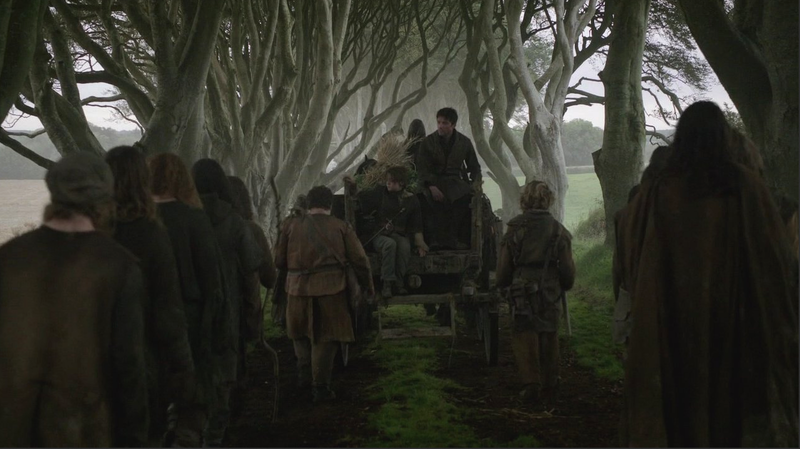 The Dark Hedges were also featured in the mini-series Game of Thrones. During the first episode of season two “On the Kings Road” Aya Stark has dressed herself as a boy and escaped Kings Landing. She and others travel the King’s Road to join the Night Watch. A bad storm knocked down a few of the beautiful trees this past year, but the grove of beaches and their eerie canopy is still worth seeing and photographing. Regardless of the legends and the ghost story, the Dark Hedges is a worthy side trip for anyone traveling to the Antrim Coast. Perhaps it’s the energy given off by the trees, but there’s a definite thinness about the place. 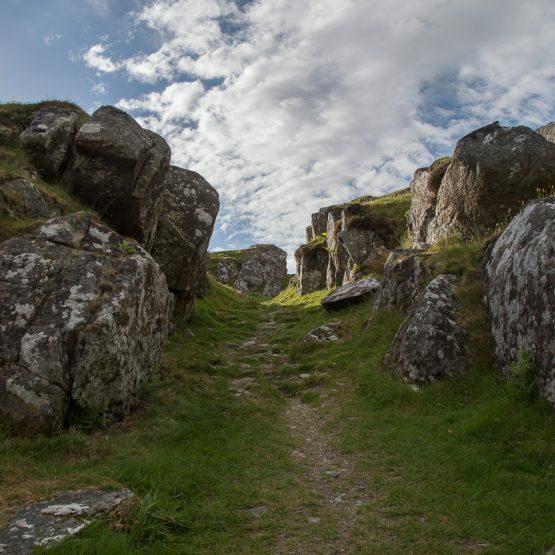 Because it’s close to the Antrim Highway, it’s easy to access for those who are in the area visiting the sites along the coast. The Dark Hedges is on our Discover the North tour of Ireland.